World 4-1 is the first level of Giant Land in Super Mario Bros. 3. This level introduces massive enemies, such as Grand Goombas and Giant Koopas. The level is accessible upon completing World 3- and by going down the south Warp Pipe on the map, and its own completion will unlock World 4-2. The players starts next to some large pipes, the second of which has a Piranhacus Giganticus, and a low hanging cloud, followed by some more giant enemies and a Giant ? 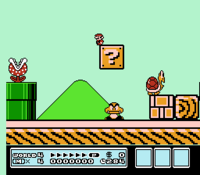 Block containing a power-up that the player has to kick a Koopa Shell into. Afterward are some waterfalls the player can swim up to reach a secret area in the Warp Pipe to the far right, where two 1-Up Mushrooms can be found, along with some Big Berthas. Beyond the waterfalls are a Grand Goomba, a Colossal Koopa Paratroopa, and a Giant ? Block containing a power-up. Continuing on, the player will have to jump across a chasm using pipes and clouds as platforms to reach a pipe leading to the goal. This page was last edited on April 5, 2019, at 10:54.